Do not lose your inner peace for anything whatsoever, even if your whole world seems upset. Hello! POSITIVE AFFIRMATIONS is the theme in The Three Muses. I went for keeping the inner peace as this is something really hard to me. Thanks to Beth Rimmer, Createwings Design and Tumblefish Studios. Great quote and image to match!! A quote I'd love to live by, Christine, your presentation is superb with the image to match the quote! I definitely need to remember that quote. I keep on losing my inner peace, too. Lovely collage! 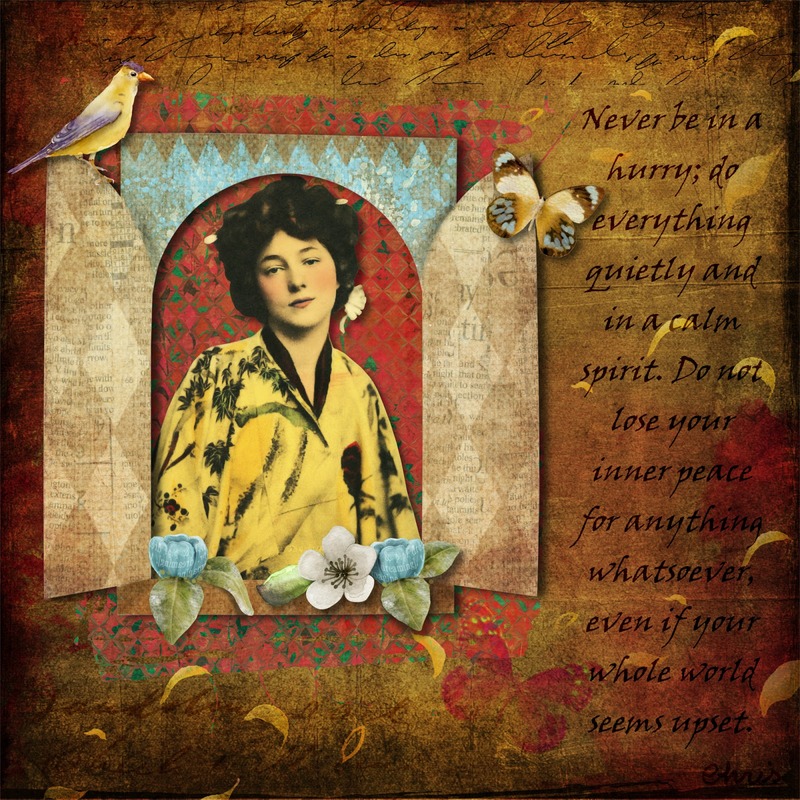 Wise words and a wonderful illustration I really love what you have done combining element and shapes in the lovely collage...excellent. image and words go together so well! wonderful quote, i should write it down and have it a place where i often look at it.. In your lovely collage there we can feel peace. The quote is very wise - but not easy to follow - my point of viw. What a beautiful thought and perfect accompanying art. I admit it's difficult for me to do anything quietly and with calm spirit. I always seem to jump in with gusto!! Lindas palavras, maravilhoso trabalho!Beijinho na alma! Oh bravo, Chris. Beautifully crafted and with words that make me think! I shall try harder to do things more slowly. Quote and image with the cheerful lady fits perfect together! Yes, your peace of art brings a bit quiet in my life. Thank you.